The last couple of months have been filled with over-indulgent holidays. Between Thanksgiving, Christmas, Hanukah, and New Years, there is no break on the alcohol, sweets, and appetizers. Obviously the holiday season is no time to hold back and every bite was probably worth it, but you may be feeling a bit sluggish and extra full at the moment. So, now that the holidays have passed and almost all the leftovers are probably out of the fridge, we can start from square 1! As much as you may want to just jump into a juice cleanse and detox your entire body, it could do more harm than good. Going cold turkey on your body after everything you’ve ingested the last couple of holidays will only make your body more confused and probably even make your cravings stronger. Rather than jumping into a liquid-only cleanse, detox your body with healthy foods, exercise, and maybe some healthy juices here and there as well. After your holiday food is all gone, you can restock your fridge and pantry with all the healthy foods to help your body get back on track. If you don’t have the food in your house, you can’t eat it. Stock up on plenty of vegetables, healthy grains, and lean proteins. You want to fill your shelves with food that your body will use as energy and boost your metabolism. Some examples of groceries to grab are: chicken, turkey, broccoli, brussel sprouts, yogurt, carrots, celery, eggs, peppers, lentils, beans, quinoa, potatoes, berries, apples, chia seeds, beets, and spinach. Obviously the list doesn’t end there but this list includes many ingredients that help to reduce bloating and keep you fuller longer. Buying the healthy foods is just the first step; now you need to know how to use them. Your post holiday meals will want to be focused around protein. You will want a large helping of chicken, turkey, pork tenderloin, eggs, or protein powder with your meal. For example, if you’re having chicken, quinoa and vegetables, you will want the chicken and vegetables to be the largest part your plate, then quinoa to supplement. You will be surprised how full you feel after a lot of protein and a lot of vegetables. Veggies will provide great carbs that make you feel full without feeling weighted down as if you were eating french fries or chips. Similarly, if you’re having a smoothie be careful on what you’re putting in it. Some people will throw a bunch of fruit and some veggies into a smoothie and think: HEALTH. However, when you break it down, it’s really only carbs that you have put into your smoothie. Next time add some vanilla protein powder or greek yogurt to add some much needed protein. Also up your detox with chia seeds or flax seeds in the smoothie. Food is a large portion of staying healthy. However, burning some extra calories is also great for the mind, body, and soul. 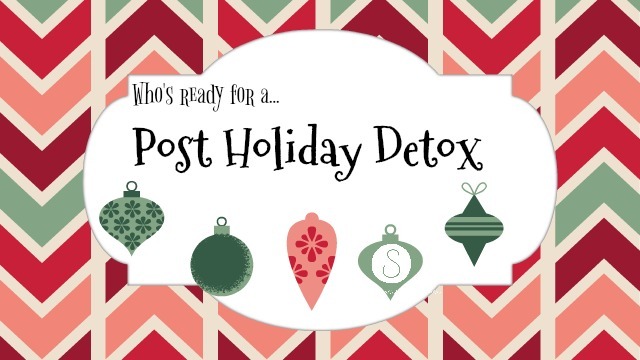 A good way to detox the body is starting to burn off the calories that you ate but also keep that metabolism going so it sheds some of that unwanted fluff you may have acquired during the holiday season. It could be as simple as adding some daily walks or runs into your routine. Or, if you’re already a fitness-oriented person, change up the weights you lift or increase the intensity a bit. Don’t, don’t, don’t skip meals OR skip out on certain food groups. Skipping breakfast or any other meal to try and eat less calories throughout the day can actually do more harm than good. When your body gets hungry and then doesn’t eat, it goes into starvation mode and will actually hold onto your fat and slow down your metabolism, the exact opposite of what you want to happen. So, rather than cutting out calories, just eat good and efficient calories! Also, don’t cut out certain food groups. Just because the holidays are over don’t go « alright, no more carbs. » This is also a more harm than good solution. Your body needs carbs for energy and to stay full. Cutting out carbs will make you want to eat more and probably increase your cravings. Once again, choose good carbs. Just because we say you can eat carbs doesn’t mean you can get fries or ice cream, replace with quinoa, loads of vegetables, or brown rice. Guess what, we all over indulged and we all may feel a little gross right now. But it is reversible. Get back into your routine and you’ll be feeling like your old self in no time. In the big scheme of things, the holiday season of overeating was a very small period of time. If you follow an 80/20 healthy lifestyle and regularly stay active and eat healthy, the holiday eating shouldn't effect you very much and should be easily reversible. Just look back on the fun times you had and how worth it the food and booze all were! Overall, we hope everyone had an amazing holiday season and are ready to get back on track with us. We hope to see you in the studio soon to continue your year of wellness!